Bring a large pot of lightly salted water to a boil. Add pasta and cook according to package directions; drain. Meanwhile, in a large skillet, heat oil and sausage; cook through until no longer pink. During the last 5 minutes of cooking, add onion and garlic to skillet. Add broth, basil, and tomatoes. Cook over medium heat for 5 minutes to slightly reduce. Add chopped spinach; cover and simmer on low heat until spinach is tender. 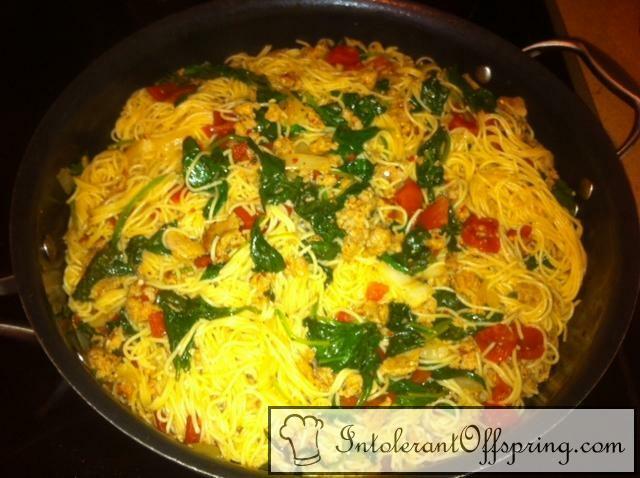 Add pasta to skillet and mix together. Sprinkle with cheese if using and serve immediately.